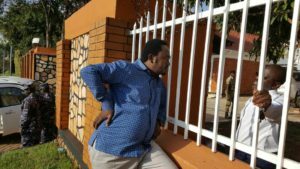 Crispin Kaheru, the Coordinator of the Citizens’ Coalition for Electoral Democracy in Uganda, stands outside ActionAid offices that were raided by police in September. File photo. KAMPALA— ActionAid International Uganda, a civil society organisation, whose accounts were frozen over accusations of money laundering and supporting opposition activities in Uganda, has petitioned the Commercial Court seeking re-opening of their accounts. The civil society organization in its petition notes that the Financial Intelligence Authority (FIA) closed its five bank accounts for various currencies, which were being operated by Standard Chartered Bank. The FIA is a government agency established by Parliament to monitor, investigate and prevent money laundering in the country. It is also responsible for enforcement of Uganda’s anti-money laundering laws and monitoring all financial transactions in the country. Court documents show that as of October 6, ActionAid had Shs538m on one of the accounts and $160, 689.87 (about Shs600m) on another totaling to more than Shs1b. Explaining how they came to know their bank accounts had been frozen, the civil society organisation states that on various dates in October they attempted to make transactions on the accounts but were rejected by Standard Chartered Bank. “Attempts to get an explanation from the second respondent (Standard Chartered Bank) were [fruitless] pointing to Bank of Uganda issuing a freezing order,” ActionAid petition reads in part..
ActionAid is seeking court to declare that FIA directive to Standard Chartered Bank to freeze its accounts is illegal. Arthur Larok, ActionAid’s Country Director, who led a number of his staff wearing white T-shits with protest words “unfreeze ActionAid bank accounts” yesterday lamented how the closure of their accounts had crippled their operations. On September 20 and 21, police raided and searched offices of ActionAid in Kansanga, Kampala, on grounds that the organisation was involved in money laundering. According to the search warrant, police were supposed to access computer accessories (electronics), mobile handsets, money transfer related documents and bank related transaction documents.